I hope that your week is flying by or that you’re soaking in the last few days of your vacation! Wednesdays are always a day to celebrate, because you’re either celebrating surviving half of the week or getting started early for the weekend! Anyway, today’s book review is on a surprising gem and the second book of my KISS series this summer. Hidden by M. Lathan is a teen paranormal read that offers a unique twist on the popular genre trend! SPOILER ALERT: This does not revolve around vampires! (and i’m really digging that!). So before I go further let’s roll out the four P’s! After scrolling through the Kindle free books for the KISS series, I noticed that witches were starting to make a comeback in the paranormal genre. Don’t get me wrong I love vampires, werewolves, faeries, and fallen angels, but witches are where my love for the supernatural began (and yes I am referencing Harry Potter but also a few other series (like Cate Tiernan’s Sweep/Wicca series). So I was excited to see the insurgence of witch-focused novels back on the YA paranormal scene. With Hidden by M. Lathan, I was anxiously awaiting to delve into Leah’s story and find out what dangerous adventures she’d be getting into while on the run from these hunters. Although I was excited, I wasn’t expecting this read to be as good as it was–a nice surprise for me! The story did start of slow, a slight draw back for me as a reader. The first chapter had a lot of background information which could have been spread out a little bit more over the beginning chapters. It took me a few pages to fall into the main character’s mindset with the first person narrative, but once I was there the story was smooth sailing. The story really picked up when Leah fled the orphanage. Once Leah leaves, we are introduce to new characters that are a lot more interesting than the annoying girl group that harassed Leah while at the orphanage. With these new characters we find mystery and intrigue, a love interest, and more supernatural happenings. Leah begins to learn who she is (aka Christine), what she can do, and that she isn’t alone in the exterminated-witch-world. Lathan really creates a great group of sub-characters to help move along the plot. As a reader, I look for the chemistry between characters like a movie-critic looks for the chemistry between actors. If a supporting character is written well, it makes the story so much better. Each of these new supporting characters sheds light into a different piece of the puzzle; whether it be in helping Leah/Christine discover who she is, helping her come-out of her shell, or giving her an enemy to work off of. As you can tell, Hidden is a novel of self-discovery and growth for the main character. We see her evolution into a stronger female lead as the story ends. But, the novel also has its twists. These supernatural twists are what drew me into loving this story. The mystery behind who Leah was and the sup-plot from her family history were great attention holders. The suspense of trying to stay hidden while hunters were after her and the added introduction to a new enemy also kept the action prevalent. Her budding romance with a certain supernatural male hottie didn’t hurt either! (I am a sucker for YA romance after all). What I really thought Lathan pulled off well was the interwoven supernatural world with the “real” world. She made it believable and believablity is key! Overall, I really enjoyed this YA paranormal novel. Lathan did a great job creating a mystery-filled supernatural story–one that I think has the potential to be quite popular. Her plot twists centered around who Leah’s family history and supernatural talents made the story the unique and entertaining find that it was. I know I can’t wait to delve into the second book of the series Lost! 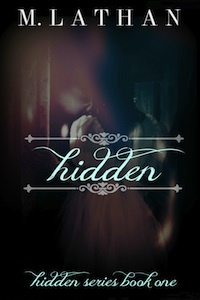 Have you read Hidden? What do you think about the new insurgence of witches in the YA paranormal genre? Let us know your thoughts in the comments below! Or Tweet us @PopCrunchBoom or with the hashtag #PCBreaders! Lathan created a pintrest based off the characters! It’s fun to check out: Pinterest. Here are the book trailers for Hidden and Lost! Enjoy! *This book was Free as of the time of this review.